What’s it like to teach Max/MSP to High Schoolers? “RANDOM 24” = This object, when sent a button push, generates a random number between 0 and whatever number is after the word “random”. 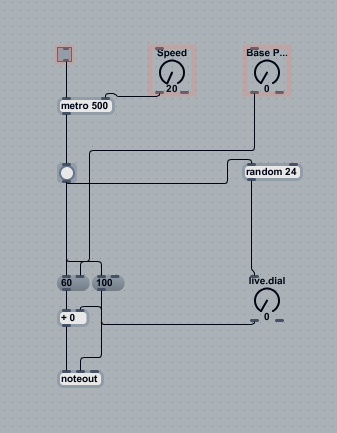 “NOTEOUT” = This has three inlets, for pitch, velocity and MIDI channel. Normally your keyboard sends out these messages, but we used math and stuff to make it instead. The synth will play whatever this tells it to. The Max patch is routed to the Scale plugin (which would be really hard to write – it filters the random notes down to a few that sound good together). The last device in the chain is the synth that’s actually making the sound. We put this chain on 3-4 tracks, and record ourselves playing notes at different speeds and levels. The result? Auto-ambience. Moral of the story: high schoolers can learn “advanced” music tech stuff, so long as you’re willing to learn it yourself and teach it to them. I’ve had multiple students over the years contact me during college thanking me for teaching them patching. Why? Either they’re in a music tech class and already know how to do the advanced stuff, or they’re in an engineering class using Matlab or something else extremely similar to Live. Others who go into computer science are basically familiar with logic routing and object oriented programming concepts. In an age where music classes don’t usually apply to the “applicable” world for most students, stuff like this is an awesome experience to give your students.